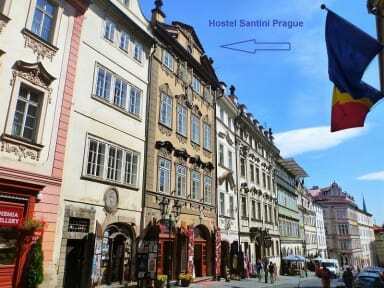 Hostel Santini Prague i Prag, Tjeckien : Boka nu! Översatt av Hostel Santini Prague ligger i en fantastisk 17-talsbarock byggnad mellan Karlsbron och Pragborgen, bara några minuters promenad från Gamla stan. Den slående stilen av byggnaden skapar en atmosfär som är unik för Prag. Detta vandrarhem erbjuder gästerna en behaglig Baland lugna, rena rum med sällskaplig gemensamma utrymmen och nattliga pubrundor. Vi gillar deras högt betyg frukost - ett bra sätt att börja dagen! Ett Hostel placerat mitt i det bästa touristområdet i Praha. Nära till nästan alla sevärdheter med gångavstånd. Great place. Located close to some major sites but also good communications with other parts of Prague. The staff was very nice and the pub crawl they offered was great. The beds were good, not too close to the other beds. The only minus was that they don't take cards, so bring cash. This place was great. Perfectly situated, clean, calm and with really nice, professional people at the front desk. The only negative thing would be the lady who did some of the cleaning, she was rude to quite a few guests for no reason. Wasn't a biggie though because everything else was so great! Will def stay here again if I visit Prague. everything super good. absolutely no negative things. Extremely nice staff in the reception, helped us with great tips on what to do around the city and with good places to eat! Super clean rooms and the nicest bathrooms I have ever come across in a hostel. Only downside I can think of is that there are no hangout areas whatsoever so not very easy to meet people. Other than that an absolutely great hostel to stay at, just a 10 minute walk into the middle of old town. Loved it here. Very good location with great connections in to town. Beautiful area and helpful personnel. 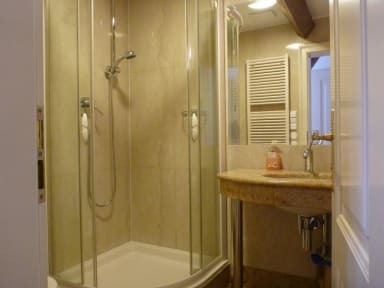 The rooms where really good, with great bathrooms. The location was amazing, in the most cozy and beautiful area Mala Strana! We had a good stay although there was some trubble with the rooms (we had to change room i the middle of our stay). But I would definitely come back! Bra läge, trevlig personal, ok rum men frukosten som inkluderades var inget speciellt. Köpte egen frukost😔 Saknade ett allrum där mm kunde hänga. This hostel is very Clean and tidy, location is ok. But the hostel reminds of a hotel; it wasnt very personal and the atmosphere is almost non existing. Dont go here if you want to make friends, but for a comfortable night in prague it does its job.